Our heart is to teach all our students the Bible, and prepare them for whatever context and ministry God has in store for them. We believe both men and women require the same rigorous theological training – alongside each other. Through our integrated teaching program we show that we equally value men and women, as well as equally value all the different kinds of ministries that they move into. We look to the portrayal of the church in the New Testament as our guide, and seek to model in our teaching, and college community, the kind of godly relationships that ought to occur between men and women working alongside each other – ones characterised by mutual love and respect. We want to prepare our women students for the diversity and demands of all sorts of roles. Some may go on to be women’s and children’s pastors – or head up mission teams in remote parts of the world – or run para-church ministries. There is no role that doesn't require the very best equipping that we can give them. As an interdenominational college, and with respect to the differing roles of men and women, we try to accommodate respectfully views that are divergent. For example, we offer chapel services where women can preach to women only, if that’s what they choose to do. When women students elect to preach to a mixed audience, if the men students believe it is inappropriate to sit under a woman’s teaching, then they have the choice to listen to a man preach. We always ensure these options are available. We have four women faculty members: Jenny Salt, Janet Riley , Rachel Ciano and Jasmine Lee, as well as several visiting lecturers. They provide biblical models of ministry for all our students, as well as mentor our women students. The SMBC Women’s Conference is held each year. It is an arena where women can bring expository preaching to women, and provides an opportunity for them to serve and encourage each other. All this, in the rich context of the wider mixed college community, offers a holistic and healthy environment in which our women are being prepared for ministry and life beyond college. Through the war years, Mary Andrews worked, watched and taught the gospel, as God grew the Chinese church despite peril and difficulty – flood, fire, famine and fighting. Often, Japanese forces were not far from Lin Hai. Two weeks after the December 1941 Japanese attack on Pearl Harbour, and the declaration of war by the United States, the Americans formed a plan top bomb Tokyo in a surprise raid which would raise morale for the USA and China and send a strong message to Japan. Nicknamed the ‘Doolittle Raid’ after its commanding officer, in April 1942 the B-25 Mitchell bombers took off from a US aircraft carrier. After successfully bombing Tokyo, and knowing their fuel was insufficient to return to the carrier, the bomber crews then flew south-west, intending to fly to small airfields in eastern China to refuel and continue their journey west into Free China. Two of the B-25s crash-landed near beaches in the South China Sea, just east of Lin Hai. Some members of the five-man crews were badly injured, and local Chinese residents, who had suffered under the Japanese, hid the airmen and helped as they were able. The Chinese magistrate in Lin Hai requested that Mary nurse them at the Christian hospital where she served. Mary willingly agreed, and the wounded crew members were brought to Lin Hai. Some had serious injuries including infected compound leg fractures, which required amputation in primitive conditions without general anaesthetic. Mary sterilised the few available surgical instruments in an iron wok over a charcoal stove. Miraculously, all airmen survived, and their presence was successfully concealed from the Japanese. When they were stronger, the Americans escaped westwards – some on foot, others carried on sedan-chairs by Chinese helpers. They finally flew out of Kweilin just an hour before the Japanese bombed that airfield to prevent their escape, and returned safely to the USA. Two years later, in 1944, driven to flee as the Japanese advanced, Mary herself has to make a similar journey through Japanese lines into Free China. She and others travelled on foot, by boat, and eventually by aeroplane, to escape across the Himalayas into India. After the war she returned to China, in a different role and a different location. She served the church there till 1951, when the communist takeover compelled the exit of all missionaries. 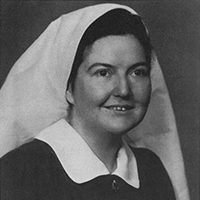 Mary became the principal of the Anglican Deaconess Training College (Sydney), 1952-1975 and became a prominent leader in women’s ministry and training in Sydney and beyond. She was made a member of the Order of Australia in 1980. Since her years at SMBC, her vision from women in Christian ministry – whether in Australia or elsewhere in the world – was always firmly interdenominational. In 1939 SMBC was affected by an epidemic of ‘three-days flu’. The ill were looked after by a Chatswood doctor, Dr Clucas, who was a visiting lecturer at the college. Clucas had several daughters, at least three of whom became missionaries. One of them, Pearl Clucas, was studying at SMBC at the time of the epidemic and helped her father by nursing the patients. “When they are ‘dressed up’ their bodies are smeared with sim-sim oil… Even as their bodies shine on these occasions, will you pray that the light of the glorious gospel will enlighten their souls’ to so shine before me that they may see their good works and glorify their Father which is in Heaven.’ To our knowledge there is not one Krongo woman in this position today, even after ten years of faithful witnessing in their midst. Prayer alone can change this. Will you pray for us, and me in particular, as only a woman can, through the power of the Holy Spirit, reach the women with the intimate dealing of soul transformation. Pearl’s twin sisters, May and Win, went to the Nuba Mountains (also in Sudan) with SUM, where they worked for about twenty years. May and Win were ‘kept together’ by the mission, which allowed them to work on the same station. Pearl worked about twenty miles away, but transport was difficult and May and win only saw her about once a year. They worked amongst tribal ‘people who had come out of pure paganism into Christianity’. With a strong sense of God’s calling specifically to Vietnam, Nancy Costello – a Sydney pre-school teacher – served there with Wycliffe Bible Translators from 1962 to 1974, through some of the heaviest fighting of the Vietnam war. Nancy was engaged in translating the New Testament into the Katu language, and was often called upon to interpret when US military personnel needed to speak with locals. She was able to assist in communicating to hundreds of displaced Katu people, who were continually wandering and travelling in search of safe locations. Many had lost contact with family members in the devastation of the war, and had had no news of their relatives for years. Nancy assisted such people by helping them return to her village, Thuong Duc, as a marshalling and reunion point. SIL/Wycliffe later published Nancy Costello’s Katu-Vietnamese-English dictionary and other books recording and analysing Katu culture. Nancy on furlough when Saigon fell in 1975, was unable to return to Vietnam. She spent the next fourteen years as a consultant with Wycliffe in Papua New Guinea, followed by another seven years in Laos, retiring in 1998. Although the majority of Katu people sided with the Vietcong, Nancy kept praying for language contacts, to enable the translation work to progress. She saw God work many miracles, as he provided willing individual Katu helpers to enable her work to go on. Katu believers continued to meet after Nancy’s departure in 1975. Now, in peacetime, although under Communism, the church is growing as Christian Katu have more chances to proclaim their faith in the unified Vietnam. Excerpts from ‘Out of Darkness: 100 Years of Sydney Missionary & Bible College' by Anthony C. Brammall.